One of the most widely used methods of numerical integration is Gauss-Legendre quadrature. It posses very attractive property of to be exact on polynomials of degree up to , while using only integrand evaluations ( -point quadrature). where values are zeroes of the -degree Legendre polynomial . Accuracy of the numerical integration depends significantly on precision of zeroes . There is no easy-to-use analytical expression for and usually they are computed numerically by root-finding algorithms. Surprisingly popular mathematical references/software provide low-precision (only 4-6 correct digits) for limited . Obviously such situation doesn’t reflect contemporary computational capabilities and accuracy demands of many applications. For instance, commonly used floating-point type double of IEEE 754 standard is capable to store values with 16 digits precision (machine epsilon is about 1e-16 for 64 bits double). This page aims to provide software libraries for calculation of high-precision abscissas and weights for any desired . This open-source library implements numerical integration based on Gauss-Legendre quadrature of any order. Pre-calculated high-precision abscissas and weights with 25 correct decimal places are used for specific orders n=2,…, 20, 32, 64, 96, 100, 128, 256, 512, 1024. Although all values can be found in the source code human-friendly tables with abscissas and weights are available too. Nodes for all other n are generated on the fly with 1e-10 precision by fast root-finding algorithm. Library also includes routine for numerical integration over 2D rectangle using product of two 1D Gaussian quadratures. If you are looking for numerical integration over the unit disk (2D sphere) you might be interested in this page Cubature formulas for the unit disk. It contains derivation details and source code in C/C++. This C/C++ library has been included without modifications in few prominent open source packages (e.g. GNU Scientific Library) as well as in several commercial software products (financial, medical, astronomical, etc.). Multiprecision Computing Toolbox for MATLAB worth mentioning in particular. It provides Gauss-Legendre as well as a full set of Gaussian type quadrature (Jacobi, Chebyshev, Laguerre, Hermit and Gegenbauer) in arbitrary precision. Reference tables on this page can be easily re-computed using this extension. There are several routines for Gaussian quadrature implemented using Matlab programming language. All of them suffer from low performance and even some of them provide low accuracy results. GaussLegendre() accepts Matlab function (inline or from m-file), integration boundaries , order of quadrature (1024 in example) and desired precision for nodes as optional parameter. Also it returns vectors of abscissas and weights if such outputs are specified. Besides being fast library usually provides results with better accuracy thanks to pre-calculated high-precision abscissas and weights. I am extending quadrature toolbox for Matlab with other rules and adaptive methods. I would really appreciate any feature suggestions and advices on what methods to include first. Table below lists Gauss-Legendre quadrature nodes for n=2,…, 20, 32, 64, 100 with the accuracy of 25 decimal digits. Data for higher order formulae n = 128, 256, 512, 1024 can be found in C/C++ library source code. High-precision Abscissae and Weights of Gaussian Quadrature. Correctly rounded to 25 decimal digits to the nearest. It’s worth looking at eigenvalue methods to calculate the nodes and weights. Basically the 3 term polynomial recurrence relation allows the roots to be expressed as eigenvalues of a tridiagonal matrix; with appropriate rescaling the matrix is transformed to symmetric tridiagonal and hence the roots can be determined to arbitrary precision e.g. with your MPFR library. Similarly the weights can be expressed in terms of the eigenvectors. Derivation of quadrature nodes using eigenvalues/vectors of Jacobi matrix is universal approach. Although it is very powerful I find it inefficient for particular well studied case – Gauss-Legendre quadrature. 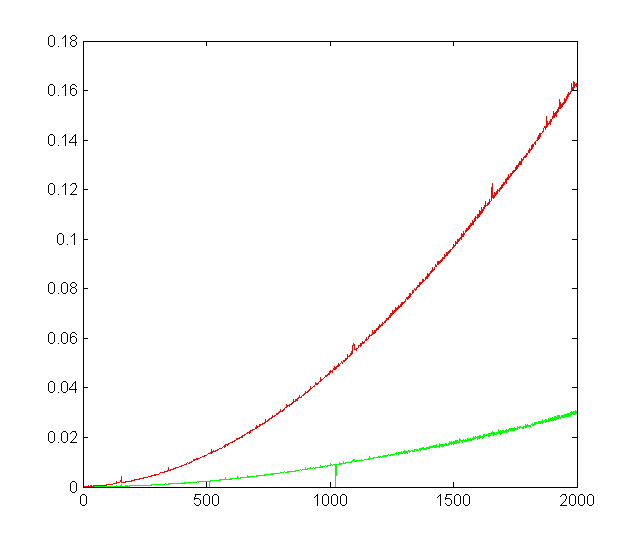 We have nice analytic formula for close approximation of Legendre polynomial roots. Starting from there Newton iterations converge to “real” root very quickly with any desired precision. I think even Golub-Welsch eigen solver optimized for symmetric 3-diagonal matrices cannot beat that. BTW I’ve used eigen method to derive quadrature for less-known weight function here: Cubature formulas for the unit disk. Thanks for reading pages on my site ;-). Do you know where I can find “Abscissae and Weights of Gauss-Legendre Quadrature” for “Associated Legendre”? Do you mean quadrature based on “Associated Legendre” polynomials? I don’t know this kind of quadrature. Could you be more specific – what task do you solve ? nice job,but I really wants to know how to use it for double integration,if some how it’s doable please let me know? I came across your site while searching for Gauss-Laguerre quadrature. Do you plan to include this in your toolbox? I am currently using the eigen method, but I expect Newton’s method with the initial approximations from Stroud and Secrest would be faster. I completely agree with you, direct root search with good starting point is much faster than eigen-solving Jacobi matrix. I have plans to cover all commonly used quadrature, plus to port QuadPack adaptive integration rules to Matlab. I will release them as a part of Multiprecision Computing Toolbox for MATLAB. It already has Gauss-Legendre and Gauss-Kronrod rules which is the most important for practical applications since it allows re-use of lower order quadrature nodes in higher order rules. Thus saving on function evaluations. First of all congrats for your excellent job. I’m currently using your code to integrate the elements of the stiffness matrix in a solver for Poisson Eq using weak form of Finite Elements Method. The point is that the code works well when I try to evaluate numerically the integral of a function in ‘x’, but I don’t manage to integrate a constant (i.e. imagine we want to do gausslegendre(@(x) 1,-1,1). The result of this operation is, as far as I’m concerned, random. Could it be possible to perform the integration of a constant using your code? Many thanks and congrats again for your work! I am looking for a way to get forces from pressure distribution on a plate and this looks like exactly what i need. But I just can’t find out a way to pass in the function pointer to the mex file. That has really puzzled me a lot. How do you solve this ? I’m integrating some very spiky functions. They are almost zero most of the time and contains one or more spikes. What is the best scheme to use for such a situation? With the trapezoidal rule I have to sample very dense for the integration to converge. Higher order schemes doesn’t seem to improve the situation. Any advice? You could try adaptive integration methods based on Gauss-Kronrod rules – it will isolate “bad” regions and sample it with finer grid. Or look up methods for integrating “oscillatory functions”. many thanks for the ultrafast code. However, i found the matlab code can not treat complex function. Do you have a solution to it? Thanks in advance. Hi, you can re-formulate integration of complex function in real domain. thanks for the neat explanation of the Gauss-Legendre quadrature rule! 1) Say we have two functions f(x) and h(x) defined over the same interval (a,b) and we wish to integrate the product f(x)*h(x), does the coefficient term (Jacobi) appear only once in this case? 2) now if we have f(x) over (a,b) and h(x) over (a,c) [ also lets assume ab > ac ], can we integrate the product f(x)*h(x) over (a,c) [ since ac is within ab] using Gauss-Legendre quadrature rule? if yes, would the Jacobi be (ac -> zeta mapping) or some combination of (ac -> zeta; ab-> zeta mapping)? Thanks for making these procedures available. I need the mex files for Linux (mexa64), so I haven’t been able to them. Is it possible for you to share the source code so I can compile the files myself or add this type of mex file? I’m also working on linux 64 and i facing exactly the same problem. Would it be possible for you to share them? (mexa64 or source code to compile it myself). Thanks for the mex implementation.. its enormous fast! Nevertheless I suspect a memory leak (at least in) quadlab.mexw64. When you call the function several times in Matlab, it seems that the used memory increases. After the first 2 calls of the for loops the memory is increasing for both integration methods. Later the memory stays constant for the quadgk command but keeps increasing with the GaussLegendre command. Thank you for the report. Memory leak is now fixed – please re-download the library. i. would it be possible to get the source code to create .mexa64 files for LINUX/UNIX? ii. is it expected that the memory usage can get so high when quadlab is called? I have tried doing some parallel implementation on a 96GB windows workstation and all of the memory is being used up. Memory leak is now fixed. I have just released the new version – please re-download the lib (using the same link above). It still has only Windows binaries though. I am not ready to go open source, but Linux version is in my todo list. (It requires more time – I have to remove some Windows-specifics first). Will keep you updated on Linux version. I tried the new mex binaries. Memory usage is much more stable, but it runs much more slowly (by a factor of 4). Answers are identical up to 1e-15 on my example, so I may switch between the old and new ones depending on how I am using them. Now fixed and should run even faster than the very first version (thanks to Intel C++). Please re-download & test the library. Pre-computed coefficients are needed for high speed. Re-generation of high-precision coefficients every time would take forever. Thanks for this useful comment, you are absolutely right. I would say if you put a commented code, since you already have it, for those people who don’t worry about the speed but the accuracy. Such a code make your post wider and much helpful popular . Library includes the code to generate nodes & weights for any required order (in double precision). Only few particular cases are pre-computed, all others are generated on the fly. Btw, I am author of the toolbox :). I already coded Gauss quadrature rule using C++, and every time I regenerate the weights and the roots using a little piece of code, but when I need to find the weights and the roots where N=64 then it takes so long time. does that what happen with you when you generate such roots and weights. It as always better to do a little research before coding. Just count number of operation (algorithmic complexity). Or learn how it is done in other libraries. Thanks for the code, it works perfectly! However, is it possible to use the Gauss-Legendre integration also for double integrals? How is it possible to implement this code for 2D integration please? First, I thank you for your useful mex function. It helped me a lot with my thesis. One problem though: I need to integrate complex functions. Since your function does not cover complex variables, I integrate once imag(f(x)) and once real(f(x)). This doubles the number of integrals I have to compute and integration is a serious bottleneck in my programs. Hi. I was really impressed by your Gauss-Legendre Quadrature for C/C++. I’ve intersted, is the ability to estimate of the absolute error in the result. like it implements here http://docs.scipy.org/doc/scipy/reference/generated/scipy.integrate.quad.html (abserr) ? Thanks! You can run two quadrature of different orders and difference in their results will give you the absolute error. I guess that for such approach there is need https://en.wikipedia.org/wiki/Gaussian_quadrature#Gauss.E2.80.93Kronrod_rules. I think that different orders is not enough, different grid is also needed. Yes, of course, Gauss-Kronrod or Curtis-Clenshaw are the best methods for such purposes. I thought you are restricted to use Gauss-Legendre. Absolutely – been thinking about it for some time. Also all Gauss-type quadrature, multi-dimensional cubature for various types of domains (disk, hypercube, simplex, etc. ), Monte-Carlo integration, etc. The only question is where to get the time & $ :). Hi Pavel, thanks for hosting such an informative thread. In situations where we integrate over the unit sphere, the basis functions become the Associated Legendre polynomials , which certainly have unique and compared to . In this case, it is unclear to me how the algorithm should be changed. And advice is appreciated!